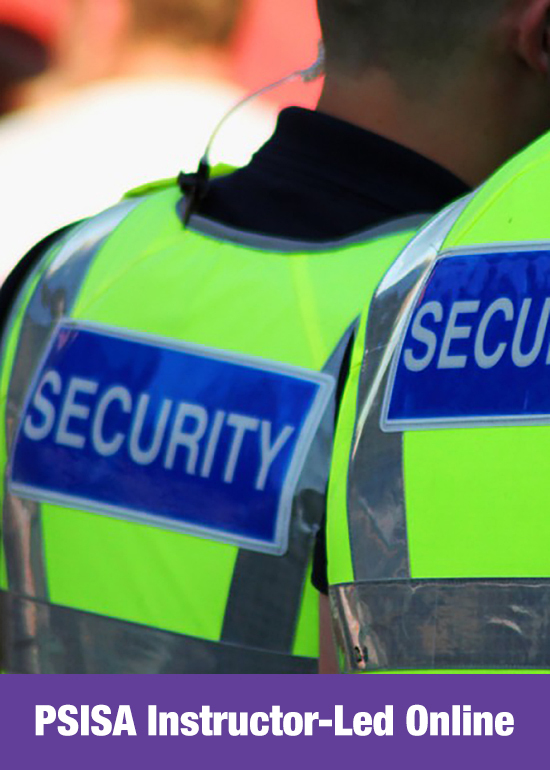 If you are looking at a career as a Security Guard in Ontario, you MUST complete the Ontario Ministry Community Safety and Correctional Services licensing process. This process includes meeting Ministry licensing requirements, completing a 40 hour course as well as the Ministry Community Safety and Correctional Services Private Security and Investigative Services Act examination. There are two options for completing the course. The first is in a classroom setting, where you attend for a week of material delivered by an instructor. The second, is an online format, such as the one provided by Infinity. In either case, the material is the same and if you do not currently have Emergency First Aid certification you will have to complete this as well. Completing the course online, is for most people, the easiest and most convenient way of meeting this Ministry requirement.The Infinity Online Instructor Led Private Security and Investigative Services Act course offers two main advantages over completing the course in class. Flexibility is the greatest advantage offered. With the Infinity Online Instructor Led Private Security and Investigative Services Act course you can start at any time and progress at your own pace. There is no need to wait for a course to start. Registration and course access takes a few minutes and the course does not expire. Students can complete the course using any Internet connected computer, laptop, or tablet device from anywhere that is convenient for them. The other advantage of Infinity’s Online Instructor Led Private Security and Investigative Services Act course is cost. Most in-class courses range in price from $200.00 to $300.00. Infinity is currently offering its online course for less than $90.00. Online learning is not for everyone so there are some individuals who would be better completing the course in-class. The materials are written in English and the facilitator voice is also in English. 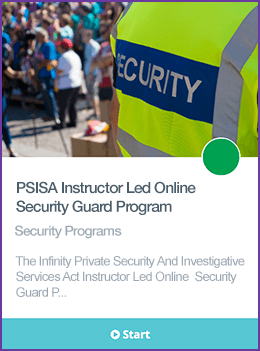 The Infinity PSISA Instructor Led Online Security Guard Course is delivered in an online format, through Infinity's subsidiary Securityguardtrainingontario.com. A currently valid emergency First Aid certificate is a requirement for completing your 40 Hour course. If you do not have a valid Emergency First Aid certificate you will have to obtain one. In the case of in-class courses, Emergency First Aid will be included in the 40 hour program. When completing the 40 Hour course in an online format, Emergency First Aid is generally not included as these types of courses require the student to attend a class. There are a number of organizations providing accredited Emergency First Aid training. Infinity has partnered with a number of certified first aid providers to deliver the required first aid training which is Emergency First Aid CPR/AED level A, in a blended delivery format (online and half day in-class). These organizations can be accessed upon registration in the course. Click on the link below to register for this course. You will be taken to Infinity's site at securityguardtrainingontario.com where you can add the course to you cart, pay, and receive your username and password. Once you have your registration e-mail you can begin right away.